When Governor Lu was about to return to his office, he came to say goodbye to Nan-Ch'uan. The Master asked him: "Governor, you are going back to the capital. How will you govern the people?" The Governor replied: "I will govern them through wisdom." The Master remarked: "If this is true, the people will suffer for it." Only that which does not teach, which does not cry out, which does not condescend, which does not explain, is irresistible. Lent, then, is a church institution embodying an exalted idea, the idea of cleansing and disciplining both mind and body toward the end of making them more receptive to the Christ ideas. 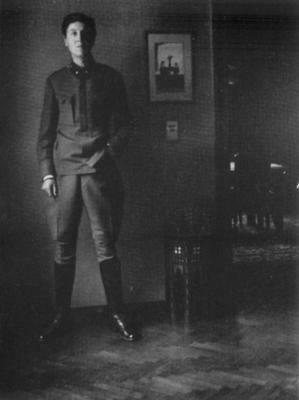 The photo is of composer Alban Berg, in army uniform in 1915. But what about Wozzeck and what's this Lent stuff? I could blame it on my fevered brain, but apparently there's no fever with this horrible cold I've got. Yes, Ash Wednesday is the first day of Lent, 40 days and 40 nights of fasting, penance, prayer and meditation. Most religions recommend some kind of retreat like this. Particularly in the Tibetan tradition, Buddhists observe a dathun which is a month or at least 28 days of meditation practice. If you have such a spiritual pilgrimage in your religion, let me know what it is---or make one up for yourself. This is ours, and in recent years I've begun to take it seriously. So this morning, I'm stuck at home drinking Dana's cayenne tea---ouch---sweating it out, doing laundry and wondering what music to play. I noticed it's Alban Berg's birthday, and I wanted a couple of CDs for the car...because later, near-dead or alive, I'm going to drive the hour to Lancaster for radiation therapy and then back. It's pledgetime on WOSU, the Columbus classical music station, and I've decided they all should go for very selective commercials to supplement funding, instead of these horrible pledge ordeals. I can't drive along and listen to that, so I picked out some Berg. Wozzeck orginally was a play written in 1837 by 23-year-old Georg Buchner, who was obsessed with overthrowing the autocratic governments of German states, including that of his own Duchy of Hesse-Darmstadt. Buchner already had gotten into trouble with pamphlets he had distributed to peasants, saying such things as "In this year of 1834 it seems as though the Bible is telling lies. It seems as though God had made peasants and artisans on the fifth day and the princes and nobles on the sixth; and as though the Lord had said to the latter: Have dominion over every creeping thing that creepeth upon the earth, as though the peasants and common people were to be counted as creeping things...The peasant goes behind the plow, but the nobleman goes behind the peasant and drives him on as he does the oxen, he takes his corn and leaves him with the stubble...[the peasants'] sweat is the salt on the nobleman's table." This was 33 years before Marx wrote Das Kapital. Buchner contracted typhus and died a month after he completed Woyzeck, as it usually is spelled in connection with his name. Alban Berg saw the play in Vienna in May of 1914. He was 29 and had written very little music by then. He said the play cried out to be set to music...and began at once. Three months later the First World War began, and Berg soon was inducted into the Austrian army. He wrote more than once in letters, the character of Wozzeck haunted him throughout his military experience, but he would not complete the opera until 1921. The work was premiered in 1925, and astonishingly was so successful that Berg had no financial worries for the last 10 years of his life. If you've never seen or heard it, you may wonder at my use of "astonishingly." The opera is very difficult, even today. The music is intense and dense, and has not lost the glint of its edge. I have yet to hear the last scenes without dissolving into tears. Otherwise, only La Boheme does that to me. The story is about a quite dull functionary around a military camp, a sort of aide who does barbering and grooming for officers. He has become increasingly distraught and has to see a doctor regularly, an 1837-style shrink. We don't know the nature of his disturbance, but he seems to have tortured visions of calamity and inferno---and sometimes shouts things in the streets. He is married to the voluptuous Marie and they have a little boy. At the end of the first act, Marie has been seduced by the Drum Major, and at the end of the second the guy triumphantly beats up Wozzeck. In the third act, Wozzeck murders Marie, and then drowns in the lake where he threw the knife. The opera ends with the little child, obliviously playing at the front of the stage. The passion with which Berg wrote the music had not only to do with the identification he felt with the character in his army experience. As he was finishing the difficult final scenes, he himself was in an affair with a woman to whom he sired an illegitimate daughter. He apparently resented his inability to control his own emotions and blamed the woman for it, creating later another infamous female character in opera, named Lulu. Marie, hardly an innocent, was the first manifestation of Lulu, whom Berg described as a "female Don Juan." Before we come down too hard on Berg, we should remember that a certain release from emotional torment had been begun by Freud only recently---and that an entire philosophical movement called existentialism would be trying in a very unique way to sort all this out. The Wozzeck story often is included in commentaries about existentialism and the poor soul pounding on the door of the Unknowable. There are a number of recordings of Wozzeck now. It often is performed, and the Metropolitan has it in the repertoire. I started listening to it, as a jazz fan---not an opera buff---over 40 years ago, and the recording I had is the one I still prefer. It is a live performace from 1951 at Carnegie Hall, conducted by Dimitri Mitropoulos, a great friend of jazz. Mack Harrell plays Wozzeck, with anguished madness and a marked peasant quality...that I think is crucial. Fischer-Dieskau also recorded it, and I remember I couldn't wait to hear it especially because it also was going to be in stereo. But I was disappointed, because the great baritone seemed to be trying to make something poetic and existential with the role---and I don't think it works that way. Wozzeck's goodness is in his victimization by everything. He can't figure anything out and the times are hard and dangerous...so he is destroyed. The most shattering parts of the score are in the 3 or 4 instrumental passages in which Berg delivers his comment on the tragic goings-on. Resist the temptation to find a recording with just that music presented. It's OK that way, but in the context of all the suffering Berg's music is demolishing. Sit through the whole opera, and then be overwhelmed by the music of the end. I found this a very good way to start Lent this morning. I thought I'd love to stage a new updated version. I'd like to put Wozzeck as the camp barber at Guantanamo...or maybe just the guy who gives haircuts at the White House. In the first scene it could be Ralph Reed in the chair. Or maybe Karl Rove as The Captain, in his new elevated role for the Administration. Wozzeck will walk into the Potomac and float out into Chesapeake Bay. Now let's see, who could we have for that Drum Major? 9 Feb 2005 @ 19:27 by vaxen : Drum Major? ...one less ignorance for me! I kept meaning to reply to you guys and time has marched on. I have not been wondering whether Herr (Herress?) Doctor Rice would be the ideal Drum Majorette for my new version of Wozzeck. It rather boggles the mind to think of Marie carried off by another woman at the end of Act I, or Franz beaten and strangled to within an inch of his life by her in Act II. But then again, who knows of what those neo-consters are capable?